Iodoral® is a tablet form of Lugol solution. One 12.5 mg tablet of Iodoral® supplies an amount of total elemental iodine comparable to the average daily intake of this essential element by mainland Japanese. 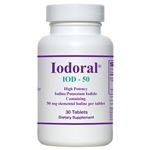 High Potency Iodoral® IOD-50 is a tablet form of Lugol's solution. One 50mg mg tablet of Iodoral® supplies an amount of total elemental iodine comparable to the four (4) times the average daily intake of this essential element by mainland Japanese. Iodoral® is a tablet form of Lugol solution. One 12.5 mg tablet of Iodoral® supplies an amount of total elemental iodine comparable to the average daily intake of this essential element by mainland Japanese.